The team at Caesar’s Plumbing and Gas is professionally qualified and trained to assist with all your gas connection, service and repair needs. If you can smell gas or you’ve received an Alinta gas bill that seems excessive, you may have a gas leak. A good way to determine that you have a leak is to turn off all your appliances at the appliance control (including those with a pilot, such as a hot water heater), then take a meter reading in the evening before you go to bed. In the morning, check the meter again – if it’s changed, contact Caesar’s. We’ll locate the problem and find a solution. Our tradesmen are fully qualified to install and service all brands and types of gas heaters, stoves and hot water systems. We can also provide advice about purchasing new gas appliances. At Caesar’s Plumbing and Gas we keep up-to-date with the latest gas appliances and can help you select the best hot water system, gas cooker or heater to suit your needs. There are many reasons why you should choose gas appliances for your home. They’re economical, reliable and environmentally friendly. 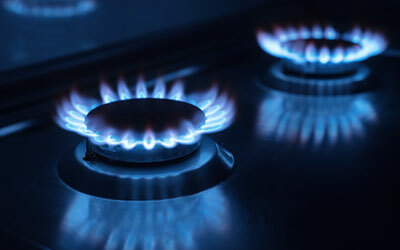 If you’re planning to buy a new gas appliance, speak to the team at Caesar’s Plumbing and Gas. We can recommend the best appliances to suit your needs and your budget.